According to the Implementing Rules and Regulations of the Republic Act No. 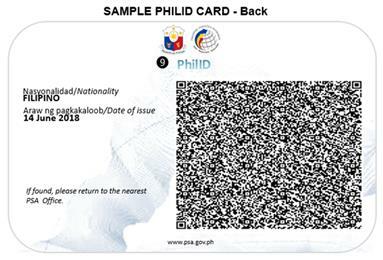 11055 or the Philippine Identification System Act, here are the procedures on how to get National ID. In the event that the applicant is unable to provide the documents under immediately preceding item, kindly prepare any of the supporting documents listed here. The applicant shall register personally at any designated registration center by submitting a duly accomplished PhilSys Registration Form (Form No.1) and presentation of any supporting documents. The PSA shall ensure that entries provided in the PhilSys Registration Form are consistent with the documentary requirements presented. In the event of discrepancies other than address, the data reflected on the presented documentary requirements shall prevail. If there are no discrepancies, the biometric information (front-facing photograph), fingerprints and iris scan shall be captured except for applicants below five (5) years of age, in which case their demographic information and front-facing photograph shall be sufficient. If the biographic and demographic information of the applicant are found to be unique, a PSN will be generated for the applicant. Otherwise, further verification shall be conducted by the PSA. In the event that the applicant cannot be issued a PSN, he or she will be notified accordingly. Registration in the PhilSys is deemed successful and complete upon confirmation of registration by the PSA and the issuance of the PSN. Once successfully registered, the person shall be issued a PhilID in a manner to be prescribed by the PSA. How much is the Registration Fee for National ID? Fees for the (a) initial application and issuance as well as renewal of a PhilID to resident aliens, and (b) issuance of a replacement PhilID to citizens and resident aliens due to loss, damage, or change of entries therein shall be subject to the schedule of fees to be issued by the PSA. Fees, however, shall not apply to citizens upon presentation of a Certificate of Indigency issued by the City/Municipal Social Welfare Office. Grade school also have to register a national id? Every citizen po. So yes. what about persons with disability (pwd) how can they register? Pwede na po bang kumuha ng id? My son is an OFW. Will you issue a national id outside our country? 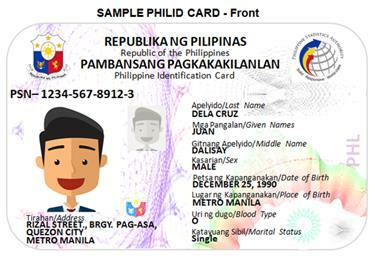 san po ba tayo makapag apply nang national id? What of hindi alam yong blood type? It’s not needed naman po. Every citizen? So even a 10 month old baby should have? Given that he/she has already a birth cert? YES. The PSA shall issue guidelines on the special arrangements, for the registration of minors. Paano po yung wala pang goverment ID ano po ba ang pwedeng dalhin? PSA-issued birth certificate and one (1) government-issued identification document with full name, photo and signature or thumb mark. Paano po kpg my problema sa birtj certificate eh isa sa mga requirments. Ipaayos po muna ninyo ang Birth Certificate ninyo. So you must have an SSS or other government issued ID before you can have a registration Form of National ID? Ano po requirements ng student? Is there any available registration in Davao City? The PSA shall issue guidelines on the special arrangements, for the registration of minors. I have two sons their age is 16 and 12 they can also avail this Philippines ID? Yes. All citizens should avail the National ID.